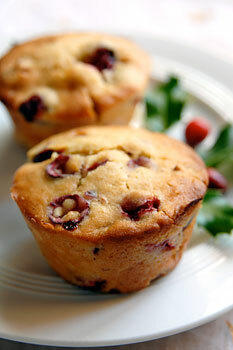 The 1988-89 fourth grade class of Washington School in Merrill, Wisconsin, proposed the Cranberry Muffin be named Wisconsin’s state muffin. This was basically their recipe, only adapted to be vegan with the egg substitute and the soy margarine. Cranberries and orange make a lovely combination. Light golden muffins start off the morning in a special way. Sift flour, sugar, baking powder, salt and baking soda into a large bowl. Cut in soy margarine until mixture is crumbly. Add the egg substitute , orange peel, and orange juice all at once. Stir until mixture is evenly moist. Spoon batter into prepared muffin cups, 2/3 full. Bake at 350 degrees for about 25-30 minutes or until golden brown. Posted by Chris Walker on November 22, 2007 in Cranberry, Desserts and Sweets, Orange. Be a part of a new Thanksgiving tradition – adopt a turkey!